Euro 5 engines will be subject to Central London's Ultra Low Emission Zone (ULEZ) daily charge of £12.50. The ULEZ comes into action in 2020 and will operate 24 hours a day, 365 days a year regardless of bank holidays. If you travel into Central London every day during the business week, you could accumulate additional fees of up to £3,250 per year. Euro 5 vans are currently cheaper to buy, but they will greatly depreciate in value with every year closer to 2020. Therefore, if you have a Euro 5 van it would be best if you part exchange it now for one that is Euro 6 compliant to maximise its value. Euro 6 vans have increased engine efficiency which means better fuel economy and less frequent trips to the pumps. If you run a fleet, decreasing your company's carbon footprint could help with taxation. Euro 6 vans have the latest specification and technology. Can I Upgrade My Euro 5 Van Now? If you currently have a finance lease agreement for your Euro 5 van, you can upgrade it right now to one of the latest Euro 6 models. Better still, if you have less than half of your agreement term left, you could upgrade your van for the same monthly payments. So, you would be getting a brand new Euro 6 compliant van with the latest technologies for no extra cost. 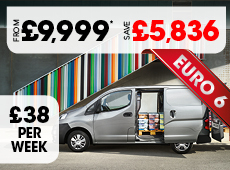 Alternatively, if you are a cash buyer with a Euro 5 van to part exchange, now is the best time to upgrade to Euro 6 so that you can receive the maximum price for your van. Trading in for Euro 6 will also save you money in the long run with the Citroën Berlingo posting improved fuel economy figures by almost 10mpg and it also receives an extra 10kg payload. The Trafic gains Renault's ENERGY dCi 95 engine for the first time with all of its Euro 6 engines boasting more powerful figures than their Euro 5 counterparts.